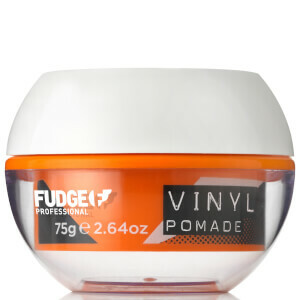 Take control of your style with Fudge Vinyl Pomade; a lightweight, flexible formula that delivers medium hold and high shine, without build-up or sticky residue. Infused with Coconut Oil, the pomade nourishes and conditions hair, whilst taming frizz and providing humidity protection for long-lasting, salon-worthy results. Ideal for creating slicked back styles. Apply product through damp or dry hair. To set, apply heat to hair.